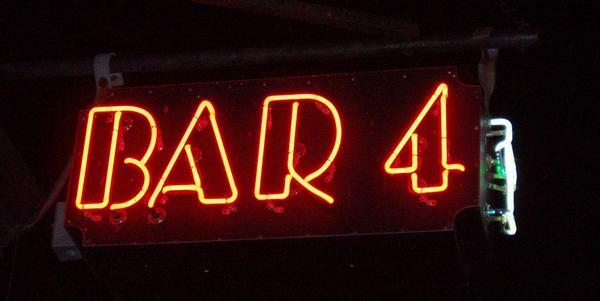 I had heard about Bar 4 once or twice from a musician friend of mine who said the jazz scene was good there. 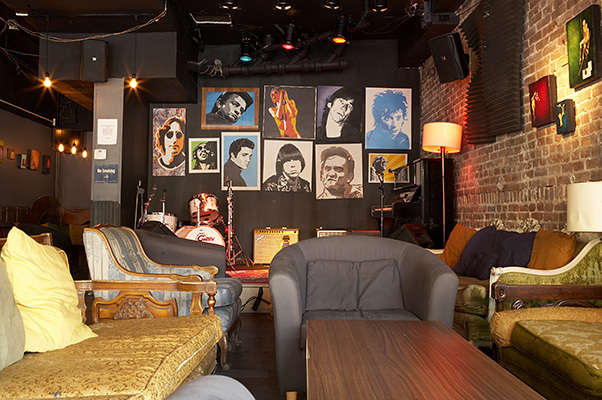 Park Slope is a little jazz enclave and Bar 4 is one of its many hotbeds of creative production. Needless to say, I did not check it out until about a year later. I’m not actually cool enough for such scenes. But last Friday, a quick jaunt through South Slope/Windsor Terrace brought me and my friend to Bar 4’s door. Inside, it is small and dimly lit. It’s not dingy at all, but cozy and immaculate. Dustless bottles behind the bar were placed against the mirrored wall which emitted a flawless glow. Comfy couches filled the floor space and the walls were covered in local artists’ work. The centerpiece, of course, were the paintings of great musicians that plastered the wall behind the stage. Upon a tip I received, I asked the bartender about the martinis. She slid a booklet my way. Inside was a selection of special martinis which are, apparently, the drinks of choice in this bar. I went for the Espresso Martini ($8). A little part of me died that night, knowing that if I followed my heart and drank nothing but Espresso Martinis all day long, I would probably get fired. So I left after my martini and I thought of its warm aroma and rousing taste for several days. Then I went back and got another on Sunday. Sweet Jesus and Mary. My second visit was somewhat tainted by the deaf trombone duo that was gracing the stage that night, but I had the incredible luck of seeing a great Park Slope musician – Zach Williams – on my first visit. He was also joined briefly by Joely Pittman who sang backup on what is now my favorite song ever, Dirty Feet. Zach actually has a show coming up tomorrow, August 8th at 8:00pm at Bar Matchless, if you’re so inclined. Zach also mentioned that Bar 4’s Tuesday night open mic is one of the best in the city. This was independently confirmed by Plainclothesman, who was there at 2:00 AM and said the place was still totally packed. This is, at best, rare for the South Slope. New York Magazine posted a tantalizing item today in their “Grub Street” food blog – the existence of a bar that serves moonshine in Brooklyn. The author would not reveal the name of the bar, but I think that a budding Nancy Drew/Hardy Boy among our readers could probably figure it out based on the clues in the article. If anyone can identify the bar, their first shot of moonshine is on me. Seriously. 1. “There’s a saloon in Brooklyn that will pull [moonshine] from under the bar if you ask nicely.” – The bar is in Brooklyn and it has a bar in it with moonshine under it. 2. “We won’t give away the place’s identity, but we will tell you to look for a bulldog.” – The bar has a bulldog in or near it. Possibly real, possibly a statue. Rule nothing out. 3. “We were recently treated to a few eye-popping, sinus-destroying shots, poured from the obligatory Mason jar.” – Patrons suffering from terrible allergies. Not unlike all New Yorkers this week. 4. “We called later to request it for a friend’s birthday party.” – The bar has a telephone. In it, presumably.